Spartans research papers discuss the Greek residents of the classical city-state of Sparta. Spartans were trained to become warriors from a very young age. The Spartan elite was the smallest of the three social castes in Sparta, but their training and reputation allowed them to dominate society. Spartiates were expected to constantly train and be ready for military action, and were thus exempt from manual labor and forbidden from engaging in commercial activity. The social rung below the Spartiates were the Periokoi, the middle class that carried on commerce. At the bottom rung in Spartan society were the helots, the slaves. 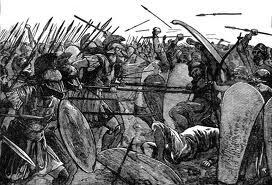 Uprisings of heliots against Spartan rule were not uncommon, and part of the Sparitate existence was to prevent or put down such occurrences. Spartan boys were enrolled in military training from the age of seven, living in barracks away from their families until they were too old to fight. Each Spartiate was given a plot of land and helot slaves to work it, which became the source of their wealth. Additionally, Spartan women were of an elevated status and educated, a rare occurrence in the ancient world. Women controlled property and were free to engage in social commerce. Thucydides research papers write about Athens and Sparta. Arrian Research Papers - One of the most colorful people of Greek history are the Spartans. A research paper on the Spartans will reveal many interesting aspects of Greece and its early. Peloponnesian War research papers on Athens and Sparta and on the great battle between the two city-states of Greece. Diplomacy Research Papers -In ancient Greece, the various city-states, such as Athens and Sparta, sent diplomats to each other in order to negotiate specific issues. Order a research paper on Diplomacy from Paper Masters. Cremation Research Papers - Plutarch points to inhumation as the prescribed practice among the earliest Athenians and Spartans, with cremation gradually gaining favor over the centuries. Critias Research Papers on the Philosopher, Writer and Historian. Death in Ancient Greek and Roman Cultures Research Papers discuss the ancient culture. However, this conviction is unusual in broader context of history. Athens and Democracy Research Papers on Athenian Democracy. Two of the greatest city-states were Sparta and Athens (Bernstein, 1997, p.45). Paper Masters writes custom research papers on Spartans and discuss the Greek residents of the classical city-state of Sparta.